At times it seemed like déjà vu to two years ago. All of the pieces were in place to replicate that same outcome. 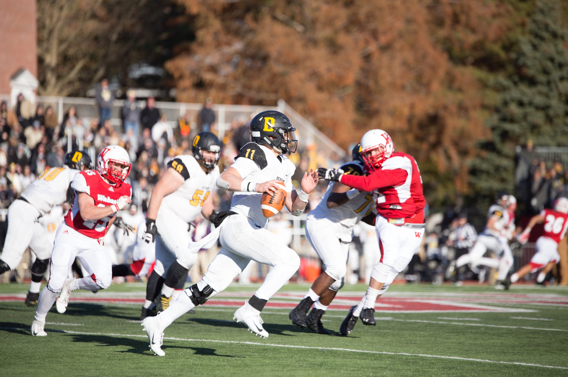 When former DePauw University quarterback Matt Hunt found now senior wide receiver Andy Hunt in the corner of the end zone with little time left on the clock, they, and the rest of the team, gave the Tigers a Monon Bell victory for the first time in seven years. However, there were no late game heroics this turn around. No one stormed the field. There was no bell. The Tigers fell short to the Wabash Little Giants with a final score of 24-17. Wabash jumped out to an early 7-0 lead when Wabash quarterback Jack Reid connected with Ryan Thomas for a 79-yard touchdown strike. The scoring didn’t halt their game in the first quarter for the Little Giants. The Wabash defense recovered a fumble and took it back 54 yards to the house to push the lead to 14. Although that was not the main storyline in the opening quarter. 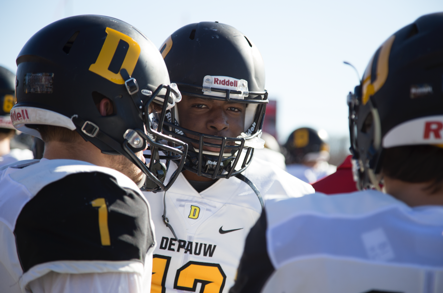 DePauw’s senior quarterback Matt Labus made his first start since injuring his knee in the home opener. It did not go as planned. Labus re-injured his knee in the first quarter knocking him out of the contest. 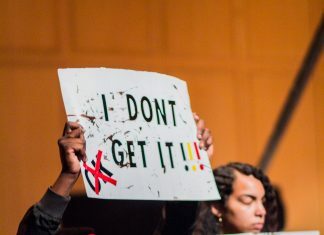 This event garnered very close parallelism to the “Friday Night Lights: movie, when star running back Boobie Miles re-injured his knee in the film. When Labus went down, the Tiger offense was able to bounce back in the second quarter under sophomore quarterback Chase Andries. Andries led the offense down to the Little Giants one yard line, capping off the drive with a touchdown pass to Hunt on fourth down. 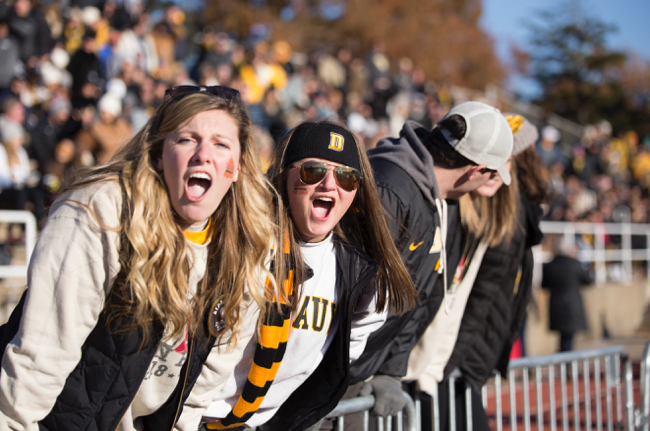 A critical muffed punt by the Tigers late in the second quarter proved to be costly as Wabash regained the possession deep in DePauw’s territory. Wabash was unable to convert on third down and was forced to boot a field goal widening the lead to 17-7. Once again, the Tiger offense responded as Andries connected with Hunt on the first play of the drive for a 48-yard gain through the teeth of the Wabash defense. Later in the sequence, Andries scrambled out of the pocket to his left before throwing a dart across his body to senior wide receiver Michael Grace for the score. Wabash held a three point lead, but would never look back. On the ensuing drive, Wabash took control and marched down the field on nine plays. Reid found Ivan Martinez for a 9-yard score with 13 seconds left in the half, giving Wabash a 10 point cushion heading into intermission. It was a tale of two halves for the offenses in this battle. Neither side was able to get anything going in the third, as both defenses kept each other off of the board. The scoring resumed in the fourth when Andries led the offense down to the ten yard line, but a critical stop on third down forced the Tigers to settle for a field goal. 24-17. The Wabash offense held the ball for majority of the fourth quarter as they tried to tick as much time off the clock as possible. The Tigers defense came up big once again when they halted the Little Giants offense on fourth and five to give their offense one last shot for a comeback victory. Andries was able to connect with junior receiver Will Harris on three consecutive plays, to push the Tiger offense across midfield. An incomplete pass on third down forced the Tigers to go for it on fourth and six. Andries faced pressure as he took the snap and was forced out of the pocket to his right where he was then picked off by the Wabash defense, securing the 125th Monon Bell game for the Little Giants.